The best indie or small-scale games are built around one or two basic ideas, feature a directed visual style and a catchy soundtrack. Reflexio’s central mechanic is ingenious, but how does its execution hold up? You play as a koala (for some reason) who has a magic umbrella (for some reason) that lets you reflect the world (for some reason), to collect zippers (for some reason) and aim to be eaten by a zip-faced monster thing. But don’t let the context (or lack thereof) put you off: that reflection mechanic is solid and unique. 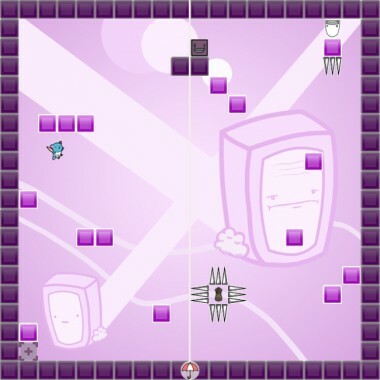 Each level is basic platformer fare, set across a grid of blocks, with an “axis” through it somewhere, around which the environment is reflected at the push of a button. Objects and blocks move relative to their proximity to the axis. So, far left of screen becomes far right, objects close to the line move a short distance, etc. Your character stays where he is, and moves the level around him to open paths or provide platforms. Your aim is to collect all the zips littered around the level, then reach the end – which is a weird little backpack monster, or something. To build on that, the axis can be horizontal, vertical or diagonal, and there may be more than one to choose from. These require a fair bit of lateral thinking, as you figure out which axis will rotate the level the way you need it. 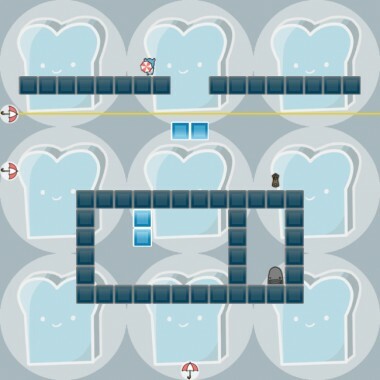 All up, it’s a very interesting way to manipulate and traverse the environment, and like most “new” puzzle game concepts, it can be hard to wrap your head around at first. It takes time to learn to predict where blocks will move once reflected, and which axis to use to get them where you want them. Levels being made up of plain squares helps a little, but often trial and error becomes the most viable method. A grid laid over the whole level might have improved the learning curve – especially as being wrong by a single block can result in a restart. If you happen to be in the way when a block is reflected into that space, it can kill you, but it isn’t consistent. Sometimes it just pushes you out of the way, or traps you inside the block. It seems the game intends for you to die if “hit” by a block, but interestingly, it’s a relief when it fails to register the hit: restarting due to a miscalculation of one block is frustrating, but when it messes up and traps or pushes you, you just reflect it back, move the character and try again. That seems like a much more forgiving system, given the complications of trying to guess where everything will move. That’s not the only area that’s more complicated than necessary. When choosing which axis to use, separate keys are used to switch to each, depending on which direction they run. So, W and S switch between horizontal lines, A and D between vertical ones, and X for diagonals. 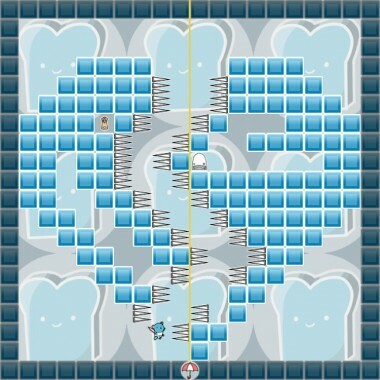 During play it often takes a bit of finger-scrambling to select the right axis. The window to pick one is usually wide open, but it still feels awkward. Reflexio’s presentation sadly lacks spark. There’s nothing wrong with a simple art style, but Reflexio’s is a bit too plain. The odd hint of personality still shines through, but it isn’t quite enough to properly colour the game. The basic blocks are useful mechanically, but they don’t look very appealing. Despite being a little too “cutesy”, the character works, and the goal of each level, that little backpack creature, is adorable. Likewise, the backgrounds are appropriately pastel to help the foreground stand out, and feature subtle, charming images that I didn’t even notice for a while. All this hints at a personality for the game that didn’t quite make it through strong enough. Unfortunately, the audio is even weaker. The music won’t stick with you long, and the only real sound effect is a conspicuously loud jump noise. With my speakers at a normal volume, the sound had enough bass to it that my dogs actually started barking from the other end of the house, and ran up the hall to investigate. I’ve never seen them do that for anything. To be honest, I ended up muting the game and playing other music in the background. If I’ve come across as too negative, I didn’t mean to be. The potential exhibited in Reflexio has me very excited, even if it isn’t as polished as it could be. It feels like Narbacular Drop: its central mechanic is genius as a concept, but the project needs some work to become Portal. With a lick of paint and a bit more depth, the game, the team, or both, may be headed for great things.